Product Sub-Category: Large Bore Industrial Hose: Hoses suitable for suction and discharge of gasoline and petroleum oils & bulk material dry cement, gravel, sand etc,. 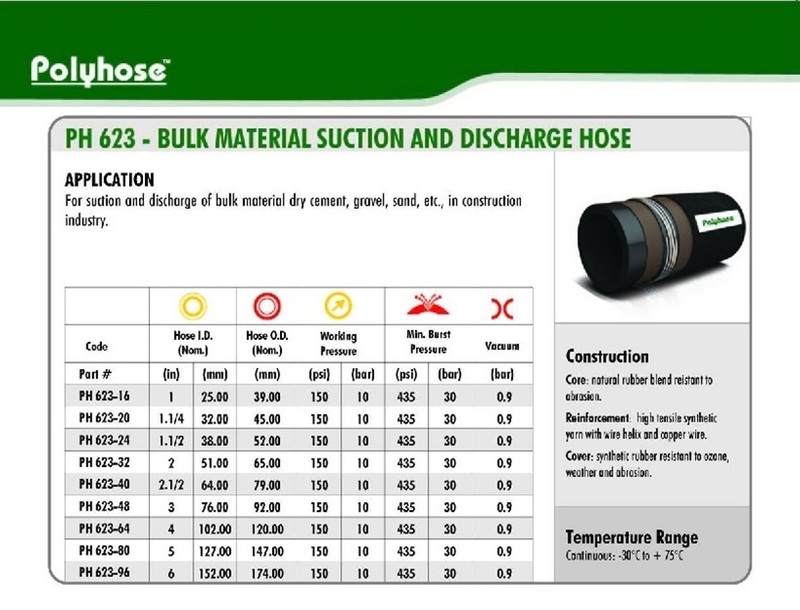 Short Description : LARGE BORE INDUSTRIAL HOSE PH623 BULK MATERIAL SUCTION AND DISCHARGE HOSE Application: For suction and discharge of bulk material dry cement, gravel, sand, etc., in construction industry. Construction: Core: Natural rubber blend reistant to abrasion. Reinforcement: High tensile synthetic yarn with wire helix and copper wire. Cover: Synthetic rubber resistant to ozone, oil, weather and abrasion. Temperature Range: Continuous: -30?C to +75?C. Application: For suction and discharge of bulk material dry cement, gravel, sand, etc., in construction industry. Core: Natural rubber blend reistant to abrasion. Reinforcement: High tensile synthetic yarn with wire helix and copper wire. Cover: Synthetic rubber resistant to ozone, oil, weather and abrasion. Temperature Range: Continuous: -30°C to +75°C.